2013 Volkswagen Jetta Pros and Cons: Why (Not) This Car? For years German car manufacturers argued that the hybrid powertrains offered by Toyota, Ford, and others were pointless, and that diesel engines were a much less complicated and more effective way to improve fuel efficiency. Apparently this was only to buy time while they developed their own hybrids, which all of them now offer. Perhaps the upcoming $845,000 Porsche 918 hybrid supercar is not within your budget, or you need space for more than two people? As always, Volkwagen offers a German-engineered alternative at a price far below the others. The new 2013 Jetta Hybrid officially starts at $25,790. After taking so long to offer a hybrid, has Volkswagen found ways to outdo the others? Or did they merely go through the motions, their heart still clearly with diesel power? The luxury of perforated light gray vinyl. 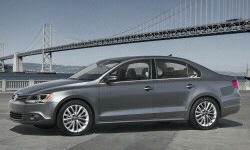 Why the 2013 Volkswagen Jetta? Volkswagen's hybrid approach is nothing like Toyota's, and not much like Honda's, either. There's no CVT transmission. And no Atkinson cycle engine where the intake valves remain open longer (good for efficiency, not good for power). Instead, the transmission is a seven-speed dual-clutch automated manual much like that offered in VW's non-hybrids. The engine is a small, 1.4-liter four-cylinder--but with a turbocharger. Total output, 170 horsepower, far exceeds the Acura's 115. As in nearly all current hybrids except those from Toyota and Ford, the electric motor is sandwiched between the engine and transmission. Unlike in the Honda, the engine can be declutched from the electric motor, permitting the latter to propel the car all by itself. With no CVT, no Atkinson cycle, and a turbo, VW's recipe doesn't sound like the best one for fuel economy. But the Jetta Hybrid does quite well. Though far more powerful than the ILX Hybrid, the VW's EPA numbers are much better, 42 mpg city, 48 mpg highway vs. 39 and 38, respectively. What's more, with its engine overmatched ILX is likely to fall short of its EPA numbers for all but the most patient drivers. In my driving the Jetta Hybrid's trip computer reported an average of 46 in suburban driving and about 40 driving on a 70-mph highway (less on a hot day going in one direction, more on a cooler day when returning). On rural, 55-mph highways, the trip computer reported averages in the high 40s, verifying the EPA number. I've observed 50-plus mpg in a Toyota Prius. But the much quicker (we'll get to this) Jetta Hybrid has all of the other hybrids beat. The Jetta Hybrid does require premium gas. But so does the ILX Hybrid. What about the Jetta TDI diesel? The EPA estimates much worse fuel economy, 30 mpg city and 42 mpg highway. But in a recent test of a Beetle with the same engine I observed trip computer averages close to those of the Jetta Hybrid. Other reviewers have reported similar real-world numbers for both powertrains. Volkswagen endowed the Jetta Hybrid with the performance-oriented Jetta GLI's multi-link rear suspension, rather than the much simpler torsion beams used in other Jettas (including the TDI). Spring and damper rates aren't as firm as the GLI's, but feel tighter than in the Acura. Push the Jetta Hybrid hard, and the weakest link becomes readily apparent. The hybrid's extra pounds conspire with its low-rolling-resistance tires to limit grip. When the outside front tire starts to scrub, the chassis feels less tight and precise, even a little overwhelmed. The stability control cannot be dialed back, but at least intervenes seamlessly. The solution: if you want to push a Jetta hard, get the GLI. Like the larger Passat, the current Jetta appears most handsome from the rear quarter. Most controls easy to understand and operate. Never figured out how to pair my phone, though. Unable to get to 60 mph in under ten seconds, the Acura ILX Hybrid is almost painfully slow. Scratch the almost. While I'd forgive such sluggish acceleration in a purely efficiency-oriented hybrid (e.g. the Prius), in a $35,295 Acura it's inexcusable. Especially when you realize that the Jetta Hybrid is not only much quicker--less than eight seconds to 60 in tests elsewhere--but also more fuel-efficienct. The good thing about the Jetta Hybrid's performance is that, if you want it to be quick, it can be quick. With the pedal to the floor it will get from a dead stop to 60 in about eight seconds. But driveability needs work. Unlike in many other hybrids (and even an increasing number of non-hybrids), you cannot choose between multiple driving modes. So there's no Eco Mode to make the throttle much more gradual and consequently make the car easier to drive efficiently. The needle on the "power gauge" (provided in lieu of a tach) jumps frantically unless you're very, very careful with your right foot. This is with the car trying to approximate an Eco Mode--if you want peak power you really have to press for it. As jumpy as the power gauge needle seems, I much more often found myself driving slower than I wanted to be rather than the opposite, due to the amount of resistance built into the throttle. On the way to the big numbers on the power gauge the powertrain seems to hesistate, as if wondering if big boost is what you really want. The transition is far from smooth and linear. A much better solution would equip the car with a mode selector. In Eco the throttle could be very gradual. In Power all hesitation and resistance could be eliminated, and output could build much more linearly. The computer wouldn't have to figure out each and every time if you were seeking Dr. Jekyll or Mr. Hyde, with a lumpy transition between them. If you desire to run on electric power alone, this can often be done for a couple of miles. One of the trip computer screens in the center of the instrument cluster includes an E-max graph that indicates how hard you can push on the go pedal without inducing the gas engine to kick on. The DSG transmission can be manually shifted, and reacts as quickly and smoothly here as in other gas-powered VWs. Some people find the DSG a touch rough around in stop-and-go driving. I detected no such issue. The Jetta is a little longer than the ILX (182 vs. 179 inches), and all of the additional inches appear to have gone into the rear seat. While the average adult will barely fit into the back seat of the Acura (those over 5-9 will be on close terms with the headliner), the Jetta has significantly more rear headroom and more rear legroom than the average midsize sedan, much less the average compact. If you like a roomy rear seat, you'll love the Jetta. Room is one thing, comfort another. The rear seat feels overly hard, and neither the cushion nor the backrest was set at a comfortable angle for me. Clearly some German engineer found these angles optimal, though. So maybe it's just me. Why Not the 2013 Volkswagen Jetta? Like other Jettas, the Hybrid isn't ugly, just bland. Very bland. This is even harder to accept at the Jetta Hybrid SEL Premium's price. Though based on the Civic, and hardly a beauty itself, the ILX has more athletic proportions (at the already noted cost of rear seat room) and appears considerably more upscale. The Jetta's interior is as boring as its exterior. It's only second here because fewer people will see it. Styled like that of other Acura's, and trimmed in leather rather than rubbery vinyl that doesn't pretend to be otherwise, the ILX's interior appears much more sporty and luxurious. Very roomy, but could be more comfortable. I'll note the rubbery quality of the Jetta's vinyl again. Some vinyl warrants the term "leatherette" by passing as real cowhide under all but the closest inspection. Not this stuff. The light gray color doesn't help. Unlike most other Jettas, the Hybrid does have a soft-touch instrument panel. This doesn't do nearly enough for the overall ambiance of the interior, which screams "fleet" (as in Hertz, not as in quick). The 400-watt Fender audio system acquits itself well, especially if you like a pinch of reverb added to your tunes. The nav, not so much. It'll do if you just want to enter an address and then get shown where to turn. But if you want to use the system like a map (guilty), you'll be frustrated. You can't zoom out far, and street names quickly disappear when you do. Is this the tradeoff for having the system standard on the top two trim levels? Perhaps. But how hard is it to permit the system to zoom out, and not drop the street names? Visibility from the driver seat is pretty good by current standards. The instrument panel is higher than I prefer, but with no steep windshield to contend with it isn't nearly as deep as many these days. The windshield header doesn't intrude into the forward view like it does in the low-roofed Acura. The rear pillars aren't overly thick, either. And a rearview camera lends an assist when backing up. So what's not to like? Well, the door-mounted armrest was too great a stretch for my increasingly sore left elbow. If you have longer arms than I do you might avoid this problem (though the overly thin padding could serve you no better). The Jetta Hybrid's battery pack does reduce trunk volume from the regular Jetta's generous 15.5 cubic feet to a slighly below average 11.3. Still more than the 10.0 in the ILX, and plenty for most uses. Need more space? Well, unlike in the Acura the rear seat folds to open up a decent-sized pass-through. Some other hybrids also have folding rear seats, but the resulting opening tends to be little more than a mail slot. In general, hybrids have a non-linear feel to their brakes owing to the need to blend the regenerative and conventional systems. The harder you brake, the less the electric motor working as a generator can be relied on to slow the car and the more the pads and rotors must be brought into play. Personally, I don't notice this much, as when driving a hybrid I do my best to only brake up to the edge of this transition, and so maximize efficiency. But many other reviewers have criticized brake feel in the Jetta Hybrid. They're much happier with the entirely conventional braking system in other Jettas, including the TDI. In general the Jetta Hybrid rides fairly smoothly. The GLI certainly feels more harsh over minor bumps and chuckholes. But on one stretch of highway the ride became so rhythmically lumpy that I stopped the car to check for a flat. Volkswagen thrwarts easy price comparisons across the Jetta's powertrains by packaging options a bit differently with each one. If you get nav with the 2.5 or the TDI, then you also get 17-inch wheels and Fender audio. To get these features in the Hybrid, you must get the top-of-the-line SEL Premium, which additionally includes xenon headlamps. And which are not available with the other two engines. Even the base Jetta Hybrid includes dual-zone automatic climate control, a feature note available with the other two engines. Bearing these differences in mind, and comparing cars with nav, the Hybrid SEL is $2,335 more than the TDI, while the Hybrid SEL Premium is $4,190 more. Adjust for the Hybrid's additional features, and these differences shrink to $1,160 and $2,015, respectively. This would suggest that the SEL Premium isn't worth the extra money, except that two of the key things it adds, the larger wheels and the uplevel audio system, are not included in the feature adjustment. VW essentially charges $855 for the pair. Seems reasonable. But this also means that the Hybrid costs a couple grand more than the TDI. Many a diesel fan will advise you to save your money. Looking to the Honda Civic Hybrid, you simply cannot equip it like the tested Jetta. You can't get 16-inch tires, much less 17s. And no premium audio. So the Hybrid SEL is a closer match. Which is not the same as close. The Civic Hybrid with $1,500 for nav lists for $3,470 less ($26,650 vs. $30,120). But even the SEL has about $2,600 more content than the Civic, including a sunroof (not available with the Honda), heated front seats (only available with leather in the Honda), a leather-wrapped steering wheel (ditto), six-way power front driver seat, power front passenger recline, manual lumbar adjusters (on both sides, no less), and a folding second row seat. Adjust for this stuff, and the VW's price disadvantage shrinks to about 900. Worth it for the Jetta Hybrid's additional performance AND economy? Absolutely. Don't need nav? Even the base Jetta Hybrid has about $400 more content than the Civic Hybrid. And it lists for only $640 more. Do the math, and with the feature adjustment the two are only a couple hundred dollars apart. Not good for the Honda. And the Acura? Well, nav is only offered as part of a $5,500 Tech Package in the ILX Hybrid. An Acura so equipped is $3,320 more than the Jetta Hybrid SEL Premium before adjusting for feature differences, and about $2,200 more afterwards. The Acura includes a few additional luxury items, such as automatic headlights, memory for the driver seat, an auto-dimming mirror, and a universal garage door opener. But the big difference is that leather isn't available on the Jetta Hybrid (you're stuck with--and to--the vinyl), while it's standard on the ILX. Drop the nav requirement and an ILX lists for $2,010 more than a Jetta Hybrid SE. Compared to either the Honda Civic Hybrid or the Acura ILX Hybrid, the Jetta Hybrid is both much quicker and more fuel efficient. It packs the sort of power an Acura ought to. It also handles better than people generally expect a hybrid to, has a roomy rear seat, and manages a decent amount of cargo space. While driveability could be better--a selectable power mode that eliminated the need for the powertrain computer to read your mind would be very welcome--the main downside to the Jetta Hybrid is how it's styled. Or, rather, how it isn't styled. In SEL Premium trim the Volkswagen is priced deep into Acura territory, but it isn't trimmed out even as nicely as the Civic. Luxurious the Jetta is not. If looks and luxury don't matter to you, but peformance and handling do, then the Jetta is you best bet in a compact hybrid (assuming the $50,545 BMW ActiveHybrid3 is not budget compliant). Though very late to offer a hybrid, VW has managed a combination that Toyota and Honda have not. But the TDI offers much of the same performance and handling, and similar real-world fuel economy, for a lower price. So be sure to check both Jettas out during your visit to the VW dealer. Hybrid battery pack steals four cubic feet. Note the bump. Volkswagen provided an insured car for a week with a tank of gas. Nick Pechilis at Acura of Memphis provided the ILX Hybrid. He can be reached at (901) 334-5525. 2013 Volkswagen Jetta pros and cons, according to Michael Karesh: the best reasons for buying (or not buying) the 2013 Volkswagen Jetta. Join TrueDelta to post your own impressions.